The last Austin Reed store closes at the end of June 2016. Austin Reed has played a big part in some of the important moments of my life. I wore an Austin Reed blazer, shirt and tie on my first date with the woman who became my wife and I wore an Austin Reed shirt to our wedding. 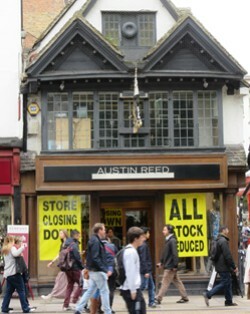 I shall be sad to see Austin Reed disappear from our high street. Having said that, I fell out of love with Austin Reed a few years ago and perhaps, like many others, I might have played a part in its demise. Laterly Austin Reed did not get it quite right. The clothes were just a bit too expensive, it was always aspirational, but thirty years ago I could afford the odd purchase there as a student; that would not be the case today. In fashion terms they had also lost their touch. Whilst never cutting edge, Austin Reed in its later years seemed to be playing catch-up. The casual clothes looked to be for an older man, even though I was older, and the suits were not quite stylish enough. Austin Reed in years gone by always had its finger on the pulse of what a certain type of young or not so young man wanted. The store was founded in 1900 by Austin Reed, yes, he was a real person. He was a fashionable young man who knew just what type of collar, tie and umbrella fashionable young men wanted to own. 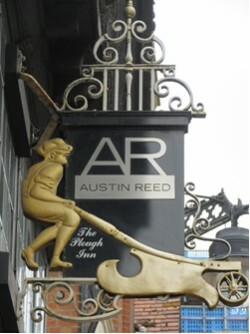 Austin Reed became the establishment's men's shop in the inter-war years. Colonials came there to be kitted out. Harry Selfridge attended a banquet to celebrate the opening of Austin Reed's flagship store in Regent Street. Design had always been important to Austin Reed stores. This was even more so in Britain of the swinging sixties. Austin Reed was one of two menswear chains that really stood out in the 1960s. Austin Reed of Regent Street and Simpson of Picadilly were where the successful young man could get the the look he wanted. Both stores had modern flagship shops where interior style was almost as important as the clothes they sold. They both offered a higher quality made-to-measure service and had ranges of clothes that had the edge in terms of discrete fashion as well as quality. Both had their own departments for younger men, 'Cue' at Austin Reed and 'Trend' at Simpson. Austin Reed launched 'Cue' in 1965 which appealed to the the smart man a little too old to be a mod, but with much more money to spend. Cue targeted men around twenty-five, but had a much broader appeal. Austin Reed continued to set the pace in men's fashion in the 1970s. In the 1980s they introduced a women's range 'Options for Women' that targeted the sucessful career woman. It is a pity that the store as chain was unable to adapt its unique brand of fashion to a new generation. The Austin Reed store in Oxford opened in 1936. It took over the historic Plough Inn site at 38 Cornmarket Street. The building is eighteenth century and is Grade II listed. It became a public house in the nineteenth century, but was taken over by the Domestic Bazaar Company in 1924. The Domestic Bazaar Company was a local chain, with branches in Oxford and Swindow, which sold household goods and toys. At that time Austin Reed totally refitted shops in their own image. There are claims that Austin Reed himself designed the staircase. However, it is more likely that this work was done by Percy Westwood, who was responsible for most of Austin Reed's shopfitting in this era.